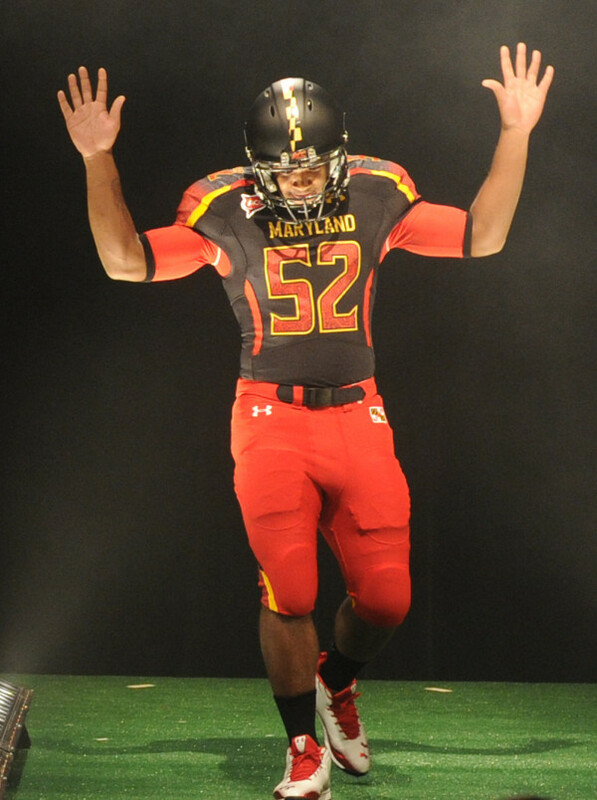 Maryland will be going back to these court jester-like Maryland Pride uniforms against Notre Dame this weekend. They’re baaaaaaaaack. 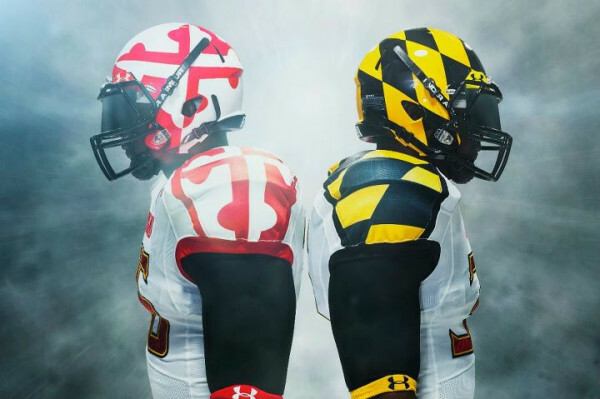 Maryland will be making waves again in the uniform world this Saturday against Notre Dame. They broke these out first against Miami in the season opener. And they will make a comeback at FedEx Field this week. The move was announced on coach Randy Edsall’s Twitter page Wednesday night. Hide the women and children for this game. The Irish will also be wearing a new helmet as part of their Shamrock Series. It has a very strange background pattern and a larger shamrock than what was seen when the Irish took on Michigan in September. This is getting out of hand. 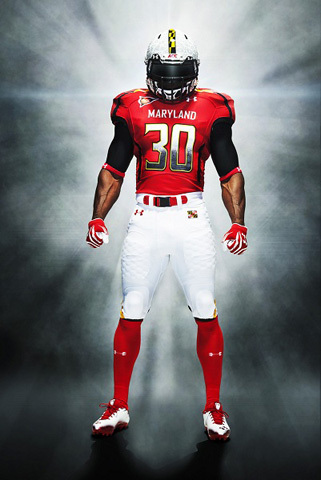 Maryland will go with a pretty conservative but sharp look on Saturday against Virginia. 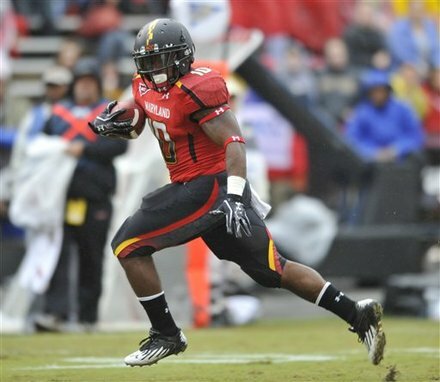 As the Terps’ play on the field continues to decline (see their 2-6 record,) their uniforms continue to get better. Let’s be honest there was no choice after the Maryland Pride debacle. This week, Maryland will host a resurgent Virginia squad in a uniform that look very similar to their old jerseys. The look is very clean. I believe “sharp” is the best way to describe it. The turtle shell helmet with the white pants looks very nice, and overall, it just might remind Maryland fans what a football uniform actually looks like. In other uniform news, Ohio stepped outside the box for a Wednesday night ESPN game. The MAC is loving the NBA lockout the most considering all the national TV time they are getting because of it. The Bobcats had a striking resemblance to Hawaii with the designs on the shoulders. Overall, I was left feeling uninspired by the uniforms, nothing special really. 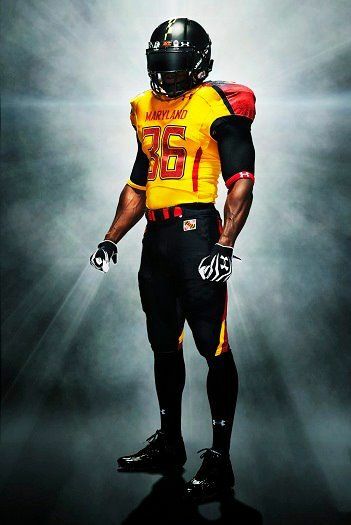 Maryland will sports these uniforms for a home game against Boston College on Saturday. The differences in the Maryland uniform are getting hard to tell. This week’s look for an ACC pillow fight with Boston College looks very similar to past home looks from the Terps. The black jerseys have been worn twice before, but those two times there were black and yellow pants to compliment the black. If Maryland was trying to be the Oregon of the East Coast with their uniform combinations, they are failing. Outside of the Maryland pride jersey for the opener against Miami, all their jerseys have been pretty low-key and not necessarily in a good way. Oregon has been going with extravagant uniforms for years now and consistently find ways to keep us guessing. It seems like the Terps have nearly run out of ideas just nine weeks into the season. Besides Maryland this Saturday, look for Ohio State to make a uniform splash, and here’s a little preview of their helmets. Maryland will wear white on the road for the first time this season against Florida State. The Terps will travel for the just the second time all season when they visit Florida State on Saturday. They will debut their white helmets that look like a turtle’s shell for the game along with this white-on-black look. I’m glad to see some design on the helmets after weeks of a plain black look and a brief glimpse of the Maryland state flag made into a helmet. The white jersey with the black pants are pretty standard, but the weird designs up the back of the legs are weird. 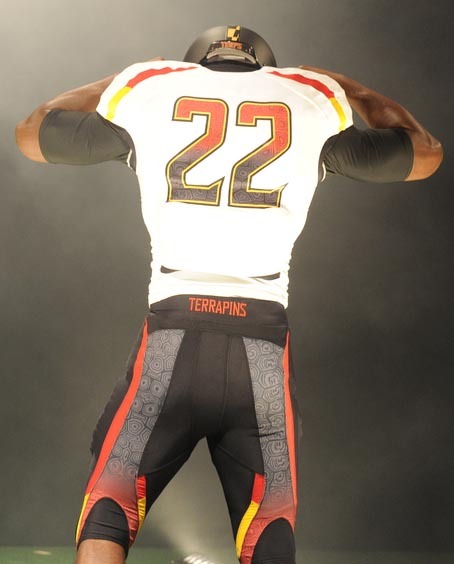 So are the multi-toned numbers on the jerseys, but nothing too crazy for Maryland this season. Maryland will go with all-red uniforms and the plain black helmets they have used all season for this week's tough matchup with Clemson. In what is the Terps’ toughest test so far this season when Clemson invades College Park, Md., on Saturday night, Maryland will go to a look that is very similar to one that worked well for them earlier in the season. The only difference between this look and Week 5’s look in a 28-3 victory over Towson is the red pants. I actually like the fact that Maryland will go with all red, it’s a pretty normal look for a team trying to always make a splash with their uniforms. Beating the undefeated Tigers will be no easy task, so perhaps the Terps want the focus to be on the way they play on the field and not what they are wearing. Week 5 College Football Review: What’s that say? The pattern inside the numbers cause problems for South Carolina and the officials Saturday. There was an event yesterday in the uniform world that I had never heard of happening before. If you watched the South Carolina-Auburn game Saturday, you might have noticed the Gamecocks helmets and pants looked different than normal, but their shirts were pretty much the same. Well that comes from a decision made by the officials prior to the game. South Carolina was wearing their “Wounded Warriors” uniforms for Saturday’s showdown with Auburn, which it eventually lost, 16-13, in pretty dramatic fashion. The Gamecocks have gone to these uniforms in the past as have other teams. 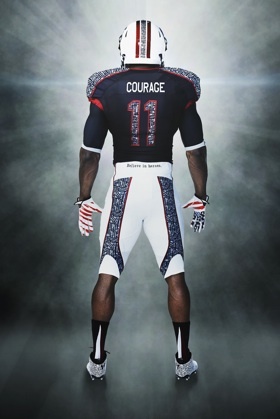 Basically it is supposed to honor our armed forces by putting names like “Courage”, “Honor”, “Pride, and “Serve” on the back of the players’ jerseys. A very good idea in theory, although it lends itself to inevitable, “there’s a lot of guys with the same name on this team” jokes. South Carolina has done this in the past, but the numbers have looked just the same as always. Anyway, the names were not the problem Saturday, but rather the numbers. The patterns inside the number made it very difficult to read, and that is why officials told the Gamecocks to change back to their regular jerseys after coming out for warm-ups. I completely agree with this. The point of a uniform is to identify what team you play for and who exactly you are. That’s why there are uniforms in the first place, to figure out which team is which just by sight, otherwise, there would be mass confusion in every single game. Identifying the player is also very important to the uniform. While those of us watching on television can do that by reading the names on the back of the uniform (in most cases) those who are actually working the game (the officials and score keepers) rely on the numbers, and that is what caused the biggest problem on Saturday. Illinois went with an orange look in their comeback victory over Northwestern. I think the look works pretty well since the rest of the field and the helmet has copious amounts of orange in it. Stanford went with their alternate black uniforms. 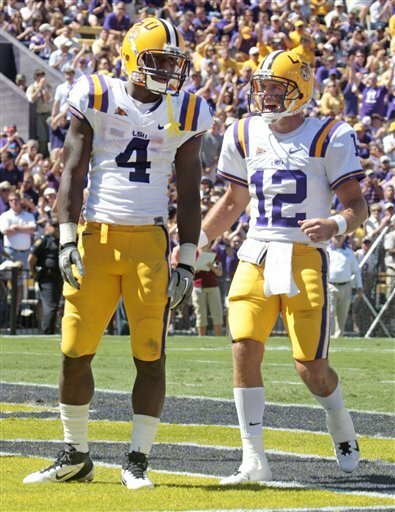 At first sight, I was not a huge fan of these uniforms, but after further review. They actually do look pretty nice. The red and black works for me. 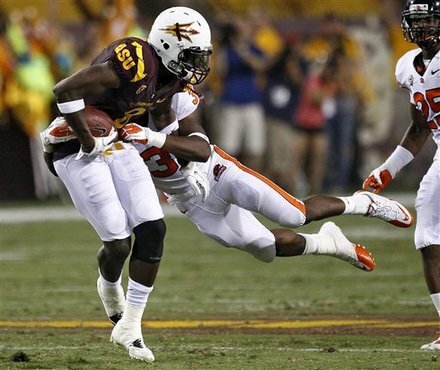 Arizona State did a bad job Saturday after a nice look the week before. The white helmets with the red jersey and white pants, makes it look like a practice jersey. It was interesting to see Michigan go back to the helmets it used to defeat Notre Dame in Week 2. I really like how the helmets have the numbers on them. They are not that noticeable and work well for me. 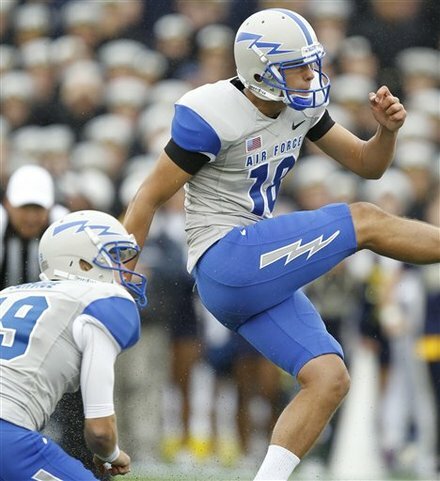 Air Force wore a nice uniform against Navy Saturday. I believe the color is supposed to look like the suit an Air Force member would wear. It’s nice. 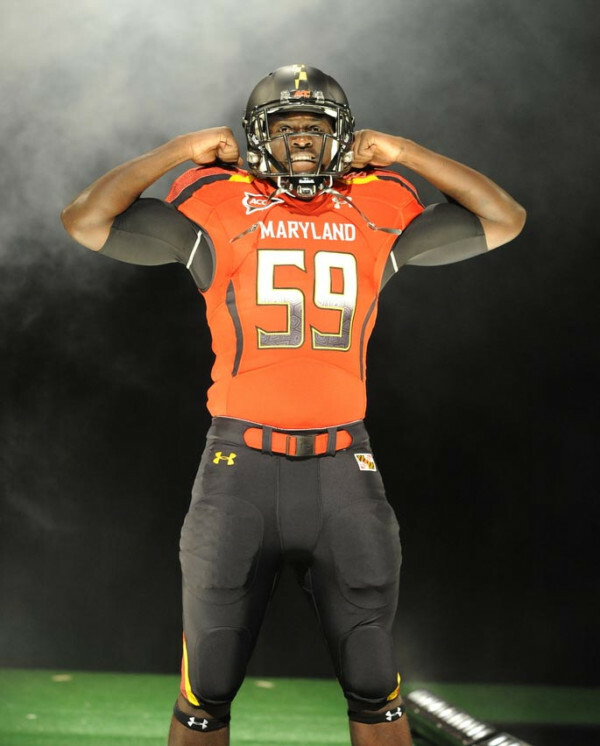 Maryland will go with a pretty simple look of black-on-red-on black against Towson on Saturday. I apologize for the delay in getting this post up, but with the madness in baseball Wednesday night, there was no time. 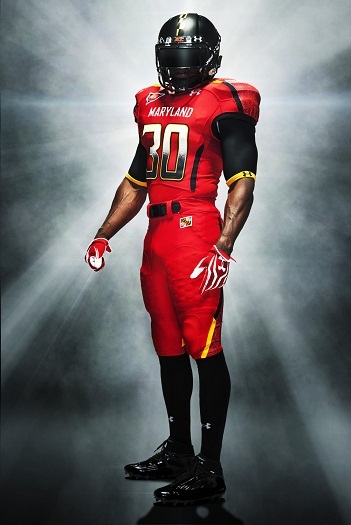 Coach Randy Edsall announced last night that this, to the left, would be Maryland’s uniform choice this week. The yellow jerseys against Temple clearly did not help, so the slight change to red was inevitable. The choice on red goes back to what Maryland used to wear before they decided to become the Oregon of the Northeast. That is a nice thing to see. Also, the small black stripe on the side is not as noticeable as the red one was on the yellow uniforms, and that is a good thing. The black helmets and black pants have become a staple over the past three weeks. It’s hard to imagine that will stay consistent for the rest of the season. Overall, it’s a fine look. Nothing too special to it, keeps in simple in what should be an easy victory for the Terps. Of course, I said that last week, and look at what happened. 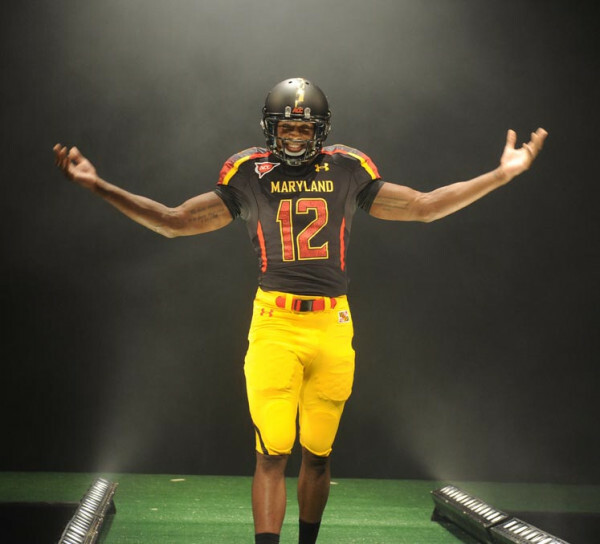 Maryland will go with a black-on-yellow-on black look Saturday against Temple. As he does on most Wednesday nights, Maryland football coach Randy Edsall answered the biggest question in college football. What uniform combination will his Terps go with this week? Edsall answer it on his Twitter page. I like this uniforms choice. It’s a bit of a change of pace from last week’s all-black choice, but it works for me. The matching helmet and pants are good, and while the yellow might be a bit bright and useable for an away game as well, it’s a fine look overall. The only thing I don’t like is the red stripe on the yellow shirt. It looks out of place. I’m not sure what function it serves. I also can’t tell exactly what the stripe on the pants is, I’ll reserve that judgement when I see them on the playing field. The way Temple looked on the field last week against Penn State, the Terps should outperform them just by walking on to the field. What’s Maryland wearing this week? Since the Terps made such a splash in the offseason and season opener with their uniform selection, they will have a weekly spot on this blog previewing their latest threads for the upcoming game. Coach Randy Edsall announced the selection on his Twitter account yesterday, saying the captains choose what ensemble the team will go with each week. The helmet does not have anything on it besides the matte finish that seems to be all the rage now. I’m not a fan of “Terps” going away on the helmet, but overall, this is better than what they went with for the opener. Here’s a look at what Maryland will trot of in this week when it hosts West Virginia at Noon. The game can be seen on ESPNU. 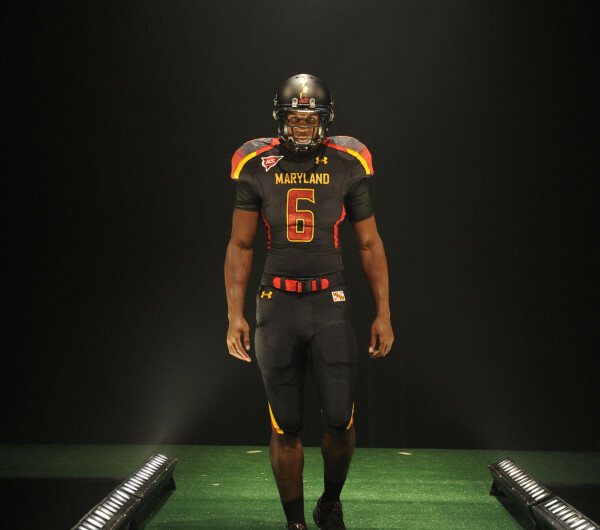 The Terps will go the way of Oregon in Week 1 with this all-black look.